As players enter this phase they already have a few years of soccer under their belt. By this point coaches should’ve established a good level of discipline meaning players should be capable of carrying the exercises and their attention span should be increasing. Also, very important is that they have a good foundation of skills and understanding the importance of being confident on the ball. Coaches should understand that sessions have to be about development and not winning since players will start competing in tournaments (if they already don’t). In those events you will probably come across teams/clubs/coaches who will try to do everything to win. (here is an article about Development Over Winning: 8 Aspects of Proper Player Development). Separate yourself from that and continue educating your players/parents about the long-term development path that you established for your team/club. Players in the previous two stages were working on ball familiarity a lot and in this stage this will continue. A big difference in this stage as they will have more game application. Our main job is to encourage our players to recognize and solve problems that present themselves in games. They were instructed and provided with a set of skills to do that. Now it’s time to apply them. Be careful about joystick coaching. In other words, you already have a big influence on your players and they will look into you for answers. Make sure you’re not telling them what to do play by play as it doesn’t do them any favors. As mentioned before they need to be able to recognize and solve problems on their own (read a post about Stages of Proper Player Development). 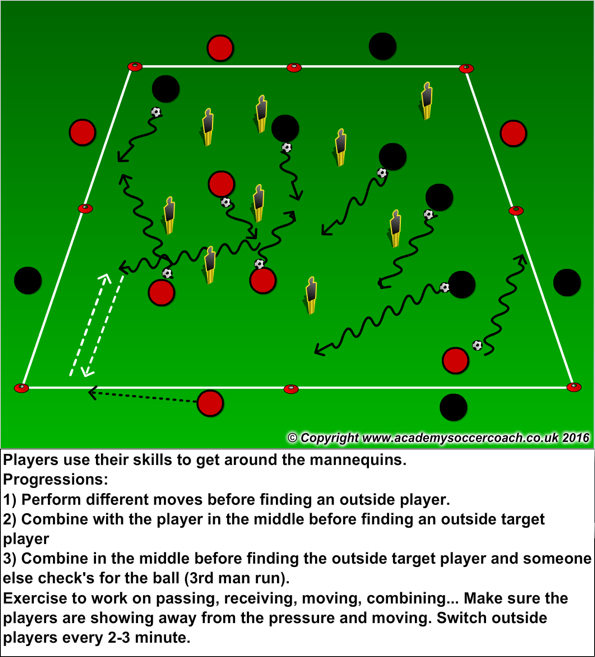 Create sessions that replicate game situations/moments so players can visualize what things will look like in games. Most of the exercises should have imitations of different game situations, from technical individual work to micro (with few numbers) to macro (small/big groups) sequences. Players should also have freedom to experiment. There shouldn’t be limit on creativity but distinguish a difference between goofing off and actually trying something productive. Player of this age are like sponges and they have the ability to sync the new information easily. That’s why is called the ‘Golden Years of Learning’ as players are not necessarily fazed by failure but rather see what they’re doing right and are eager to learn/try. They’re also seeing their skill set grow and therefore are aware on the impact on the game they have. Players are not yet impacted by the ’adult syndrome’ or ‘real world’ where we, as adults, with the experience behind us are shaped more and more by failure. That’s why we have the responsibility as coaches not the ruin or negatively impact children’s open minds but support them in becoming confident. In times when things are good but to make sure that we teach them that mistakes are not to be taken as ‘the end of the world’ but rather an opportunity. Be positive, optimistic, encouraging but also realistic. Recognize situations between being positive/supportive and actually correcting things that need to be corrected. You can’t be all smiles and laughs at all times as you won’t be doing your players a favor. Player are becoming more aware of the tactical implications in games. The ability to take players on is crucial but with an importance of recognizing situation on how to use numerical advantage. That’s why your sessions should have progression in situations varying from small to big – 1v1, 2v1, 2v2, 3v2… Passing and ball movementis becomingmore important but should not be the main focus or a measurement of how your team is progressing. Formation will evolve with the mandated changes starting with the 2016/17 season. Most popular and effective way to go is 1-3-3-2. That way your players will, beside understanding positional demands (make sure they rotate positons in games), have a good outlook on the relationship play between positions and lines. For example – outside back with central defender or outside mid, midfield players understanding how to move together, two forwards working together, pushing up, understating of spacing, pressure/cover/balance, transition, overlapping…etc. How much of the material you establish on your players will depend in how advanced they are. There are a lot of options to explore but focus on the importance of problem solving of small groups/relationships – #3 to #11 OR #6 to #7 and #10, for example. The athleticism and physical advantage can make a difference on all levels, from youth to professional. At this stage there will be obvious differences in your players in size, speed, coordination… it is an imperative you recognize those needs and work on them with your players. Don’t let the fastest player rely only on his speed. It is a good advantage but that won’t work for him/her down the road. If you manage to convince them about the importance of other development needs, you might be creating a player with a full set of skills. That is our job as coaches – recognizing, influencing and changing our players. It starts with your understanding that physical advantages are temporary and then transferring it to your players. Continue working on development of coordination, motor skills and even flexibility exercises.